A few months back, I was watching Private Chefs of Beverly Hills, a reality show on Food Network and Sasha, one of the chefs was attempting a huge Maryland cake with ten, you read right, TEN layers! I was curious to see whether the cake would hold it's shape till the very end. Sasha was not satisfied with the cake as she was layering it (it did look like a leaning tower) and decided to make a pudding out of it. Something very similar happened to me once. Oh no, I did not attempt a ten layer cake and I wouldn't for the life of me think of it, because if I did, I would probably get a nervous breakdown. I invited a friend and her family over for dinner. It was her b'day the previous day so I wanted to bake a cake for her. After contemplating on what cake to make, I proclaimed to my husband that I would make a swiss roll with custard and jelly filling. Now how could I say no to that face? 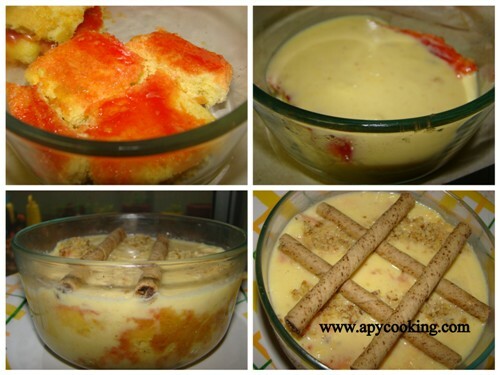 My husband loves custard and I thought of quickly making some. But ofcourse, it took a good 15 minutes to make the custard and another few minutes for it to cool down (even though it was dumped into the freezer for quick cooling). By the time I started applying jelly and custard, the cake had completely cooled down and hardened and there was no way I could roll it neatly. I went ahead and tried anyway, but the cake broke in several places as I was rolling it. And ofcourse, a shabbily rolled swiss roll is an absolute no-no, definitely not for a b'day girl! There was just about half an hour left for our friends to arrive and I was wondering whether to agree to my husband's proposition of getting a store bought cake or to pull a Chef Sasha and convert the cake into a pudding. And me being me, the store bought cake idea was smacked down. Prepare custard according to package instructions - Measure 1/2 litre milk. 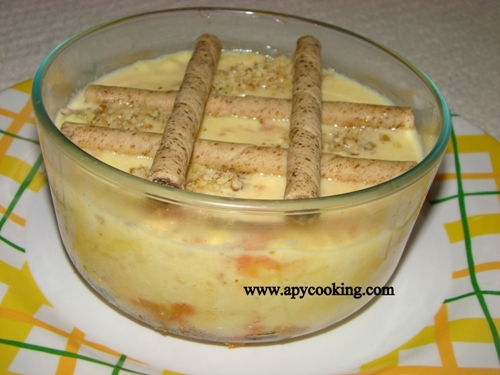 Make a paste of 2 tbsp custard powder and 4 tbsp milk. Bring the remaining milk to a boil. Add 3 tbsp sugar and the custard paste and keep stirring till custard thickens. Remove from heat. Cool. [ I eyeballed the measurements, so my custard was a little runny]. Microwave jam for 30 to 40 seconds till it becomes easily spreadable. Cool. Spread jam on the cake pieces and place in a glass bowl. Pour half the custard on top. Make another layer of cake and remaining custard. Sprinkle chopped nuts (I used walnuts). Refrigerate for two to three hours. Luckily our friends liked the pudding and the b'day girl didn't seem to mind pudding instead of cake. Whew :). So if you bake a cake anytime and if it crumbles or doesn't come off the pan neatly and falls into pieces infront of your earnest eyes, do not worry. 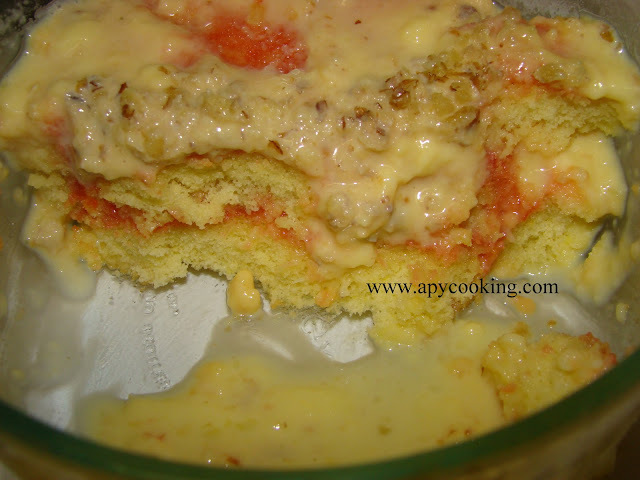 Just make some custard, or whip some cream and layer it with whatever you can think of - jam, nuts, fruits - and convert the cake disaster into a yummy pudding :)! I remember as a child, my brother and I used to hog on peanut butter. My aunt used to get us a jar each during her India trips and we used to relish both the creamy and crunchy versions. My love for peanut butter continues and now it's my son who shares it with me. Since he loves cookies I decided to make some peanut butter cookies for him. My son was very excited about the cookies. 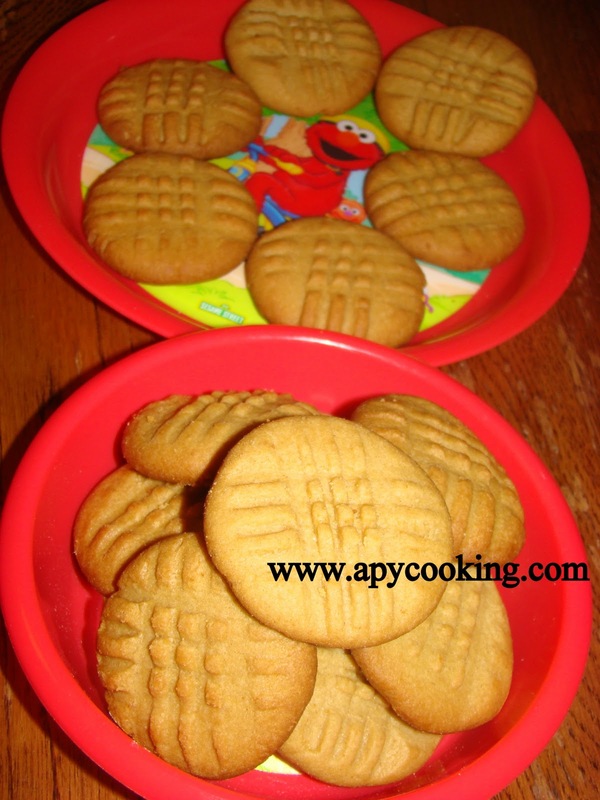 When I asked him, 'shall we make some peanut butter cookies? ', he, with a big grin on his face said, 'yes, maaamy' (he learnt the mummy part from Caillou, he otherwise calls me 'Amma'.) Infact, those who watch Caillou (or can't help watching it thanks to their two to four year olds at home) will definitely know that Caillou knows a great deal about food, helps his 'maamy' in the kitchen sometimes and even dreams of making his own pizzas. My son has learnt a few terms thanks to him - one day he actually asked me for some mushrooms! 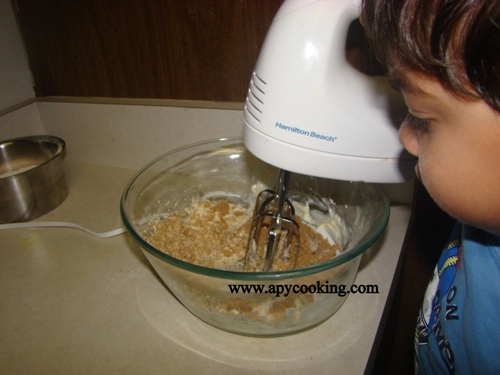 I let my son do the creaming of the butter and sugars(with a firm hand on the mixer, ofcourse) and he was fascinated by it. He even let out a 'wow' here and there. It was such a fulfilling experience for me! Note - You can substitute peanut butter with almond butter. Combine the flours, baking soda and salt and keep aside. In a large bowl, with an electric mixer, beat butter and sugars until creamy. To this add egg and vanilla and beat. 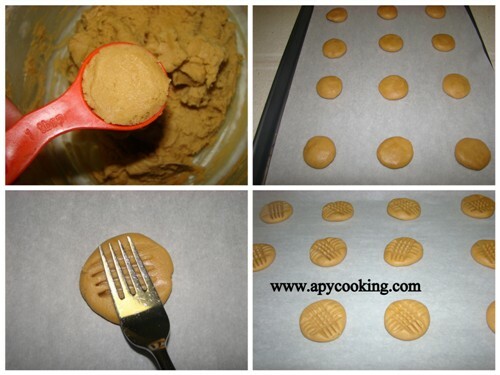 Scoop in the peanut butter and beat till it mixes well. Add flour mixture little by little and beat till well incorporated. [You can even mix with a large spoon or knead with your hands].The dough will be sticky. 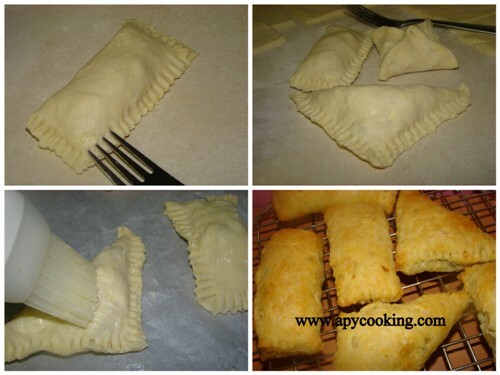 Refrigerate for one to two hours. Line a cookie sheet (baking tray) with parchment paper. 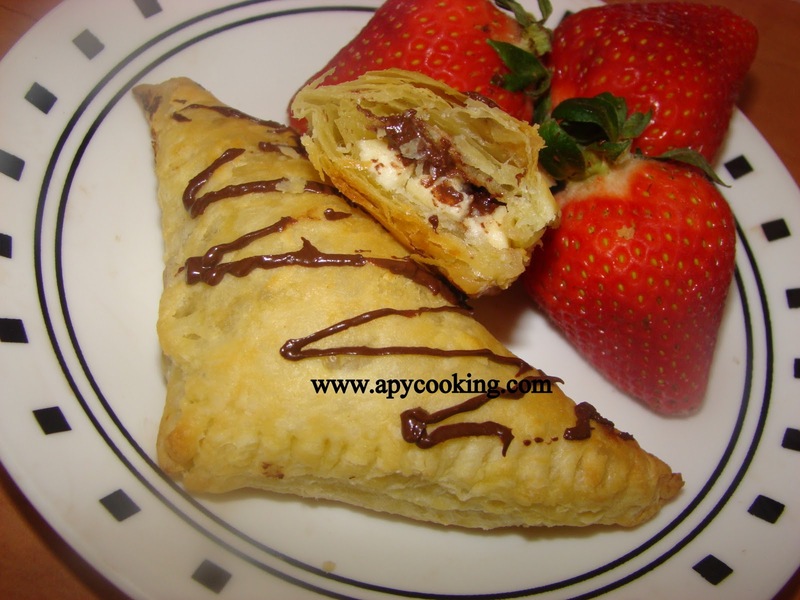 Scoop out one tablespoon of the dough at a time. Shape into balls, press lightly with your fingers and place on the cookie sheet two inches apart. 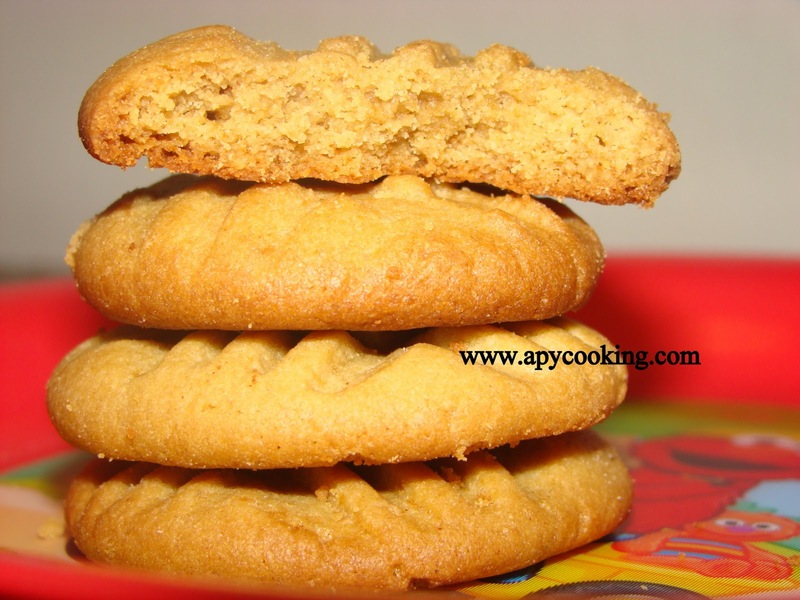 Using a tablespoon measure each time gives you cookies of the same size. 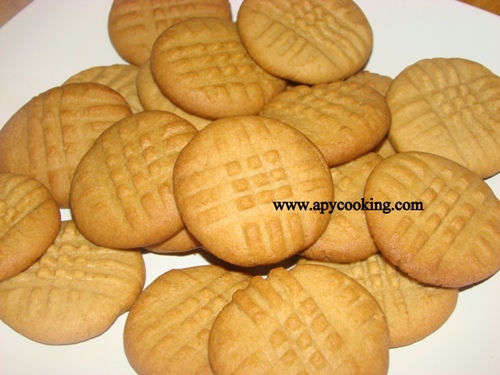 With a fork make the signature crisscross design on the cookies. [Dip the fork lightly in water to prevent it from sticking. Press the fork hard on the cookie batter, otherwise the lines will disappear]. 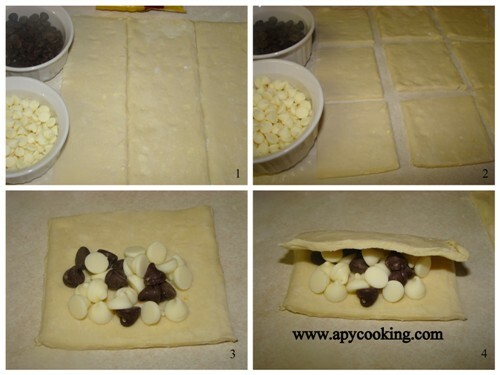 Bake for 13 to 14 minutes or till the edges look brownish. The centre will be soft and will harden once the cookies cool. Allow to cool for a couple of minutes on the cookie sheet and transfer to a wire rack to cool completely. 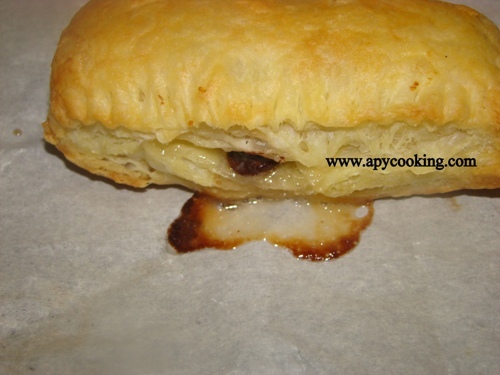 [For the next batch if the dough appears sticky, refrigerate again till firm]. Makes 32 to 35 cookies. But then again, I can't be sure since some dough found it's way into my tummy! A couple of years back, when I asked a cousin what she would like to have for dinner, she mentioned about cabbage-a muddo. 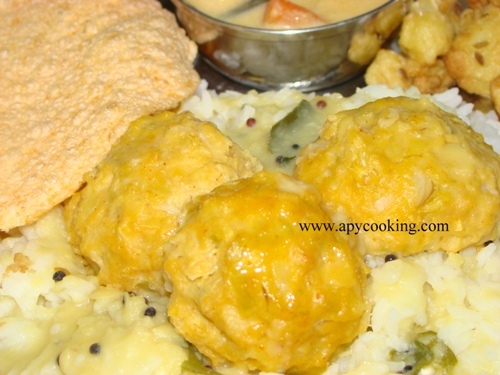 I immediately googled and found a recipe for cabbage-a undi on Divya's blog. I wasn't sure if they were the same but thought of giving it a try anyway. My cousin loved the undis and said these were exactly what she wanted. After that I have made it a few more times, with a couple of changes - I reduced the turmeric powder and, as suggested by my M-I-L, added tamarind. For the original recipe, go here. Soak idli rava in water for 15 minutes. [The water should just cover the top]. Grind grated coconut, red chillies, turmeric powder and tamarind, with very little water - just enough to get a smooth paste. Drain any extra water from the idli rava, add to the above and grind again. Do not add too much water. The batter should be thick. Add salt and hing and mix well. 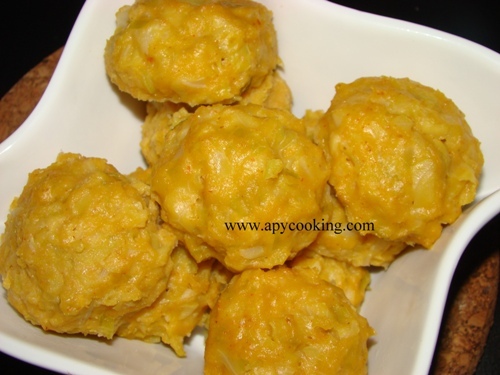 Add chopped cabbage into the batter [only as much cabbage as the batter can accommodate]. Shape into balls. Grease the steamer basket lightly. Place undis atleast half an inch apart as they will slightly increase in size. Steam undis for 25 minutes, or till toothpick inserted comes out clean. 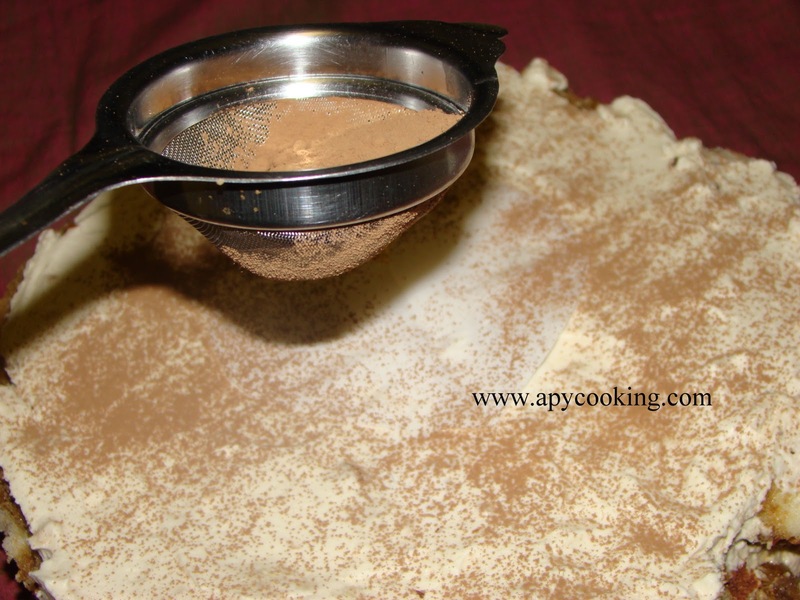 [You can even use an idli stand to steam]. To serve - In a bowl, pour some coconut oil, mix a pinch of hing. Pour on top of the undi. Tastes great with rice, dal, papad, pickle and some yummy Konkani curry. Sending these to Bookmarked Recipes. I absolutely love street food and ragda patties is among my favourites. My Pacchi (aunt) makes mouth-watering chaat dishes and I love the masala puri she makes. 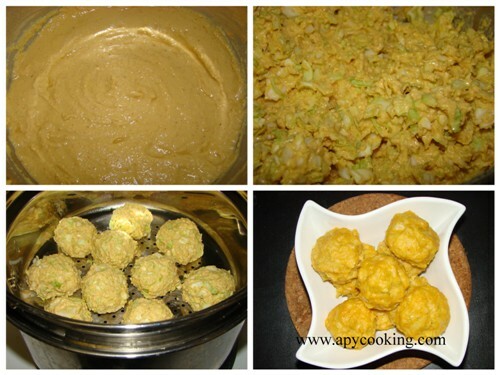 I got the recipe of the "masala" of masala puri and used it as the "radga"of ragda patties. The experiment turned out great! This spicy-tangy-sweet sauce proved to be a terrific combination with the patties and I have made it several times since then. [Update - I made minor changes to the recipe the next time around and took some pictures of the process. Have updated accordingly]. Soak white peas overnight. Pressure cook with chopped onion till 90% cooked. 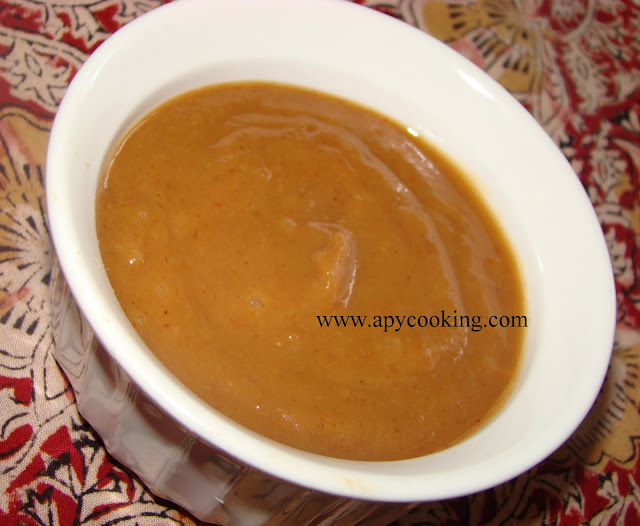 Grind red chillies, green chilly, jaggery, tamarind, grated coconut and all the powders with 1/4 cup water to form a smooth paste. 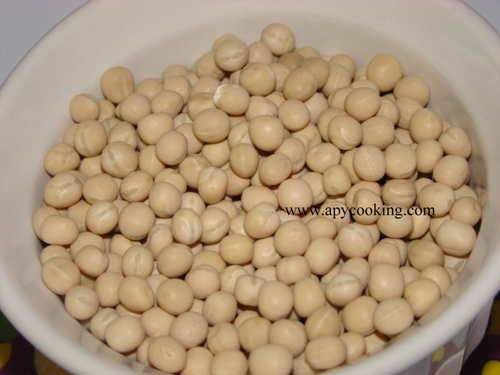 Add ground paste and salt to the cooked peas. Add one or two cups water if necessary and bring to a boil. 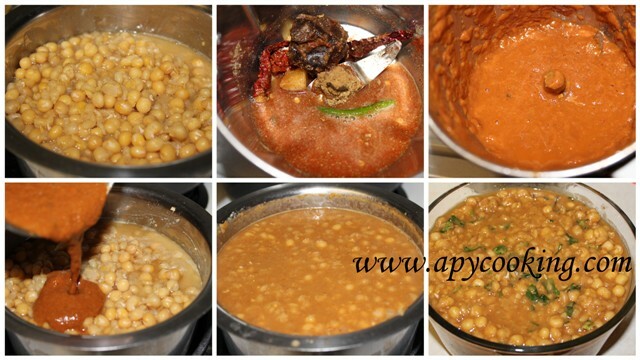 The ragda should be of pouring consistency. Pressure cook potatoes with peas. In a large bowl, mash the boiled potatoes and peas. Dip the bread slice in water, squeeze out all the water and mix with the mashed potaoes. [I refrigerated the mixture for an hour, for better binding]. Add chilli powder, chaat masala and salt and mix well. Shape into balls and flatten lightly with your fingers. In a pan, heat oil / ghee. 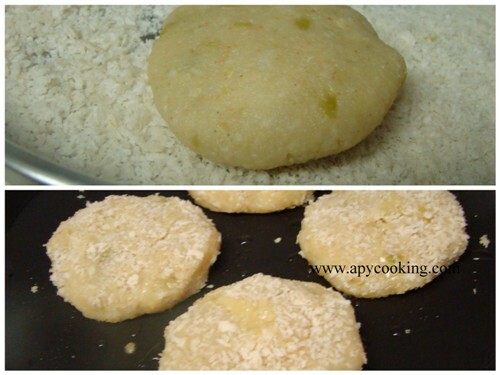 Dip either sides of the patties in bread crumbs or rava and shallow fry. [This recipe makes about 18 medium sized patties]. 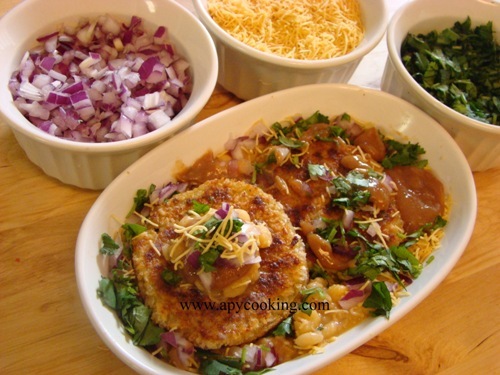 Arrange ragda and patties separately. 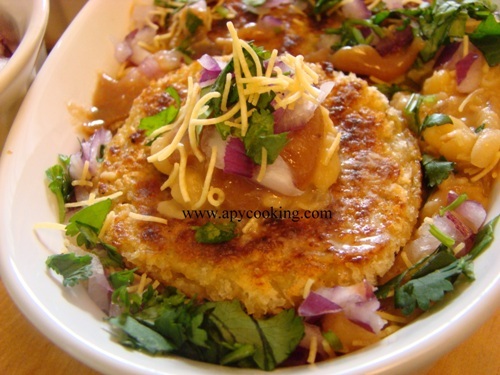 On the side, arrange date-tamarind chutney, chopped onions, coriander leaves and sev. 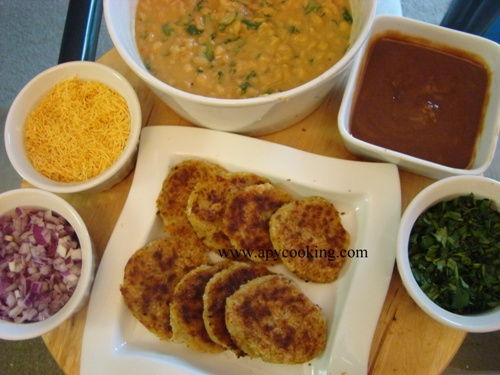 Just before serving, in a bowl, place two patties, pour hot ragda over them. Swirl about two spoons of date-tamarind chutney. Sprinkle about a spoon each of onions, coriander leaves and sev. So I started my blog at this time last year, not realising what a huge influence it would have on my cooking. And here I am, one year later, beaming at the knowledge I have garnered and happy about pushing the boundaries of my comfort zone and whipping up delicacies I hadn't dreamed I could ever make. I have all of you to thank, for encouraging me with your support, comments, and more importantly trying some of the recipes and giving me good feedback. I'm particularly grateful to my husband who, without any hesitation has eaten all that I have made, tasty or not, thus encouraging me to carry on with my experiments. Heck, I'm no seasoned cook and most of the recipes here were attempted the very first time, so based on his facial expressions after eating the food, could I decide whether it was blogworthy or not. 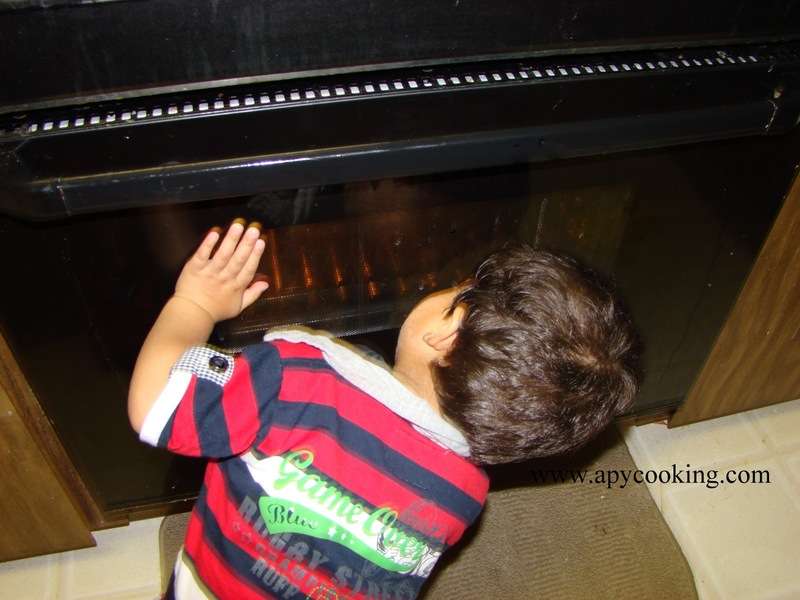 My son has been a great help too - there are many recipes included here which I made solely for him and a few others for his little friends in his playgroup. Whenever he even gets a hint that I have something in the oven, he peeks into it to get a look and waits for me to open the oven door. I'm now waiting for him to grow up a little so we can have great fun in the kitchen - baking and decorating cookies and cupcakes. I would also like to congratulate SS and wish her blog, SS Blogs Here, a Happy Bloggiversary! We started blogging on the same day and SS has constantly visited my site and unfailingly left me a nice comment on each post. Thank you, girl! Coming back to my post, Tiramisu has been on my list ever since I attempted the Tres Leches cake (which incidently happens to be the first post and one of my most favourite posts in this blog, shall I also mention, my most favourite cake in the world!). 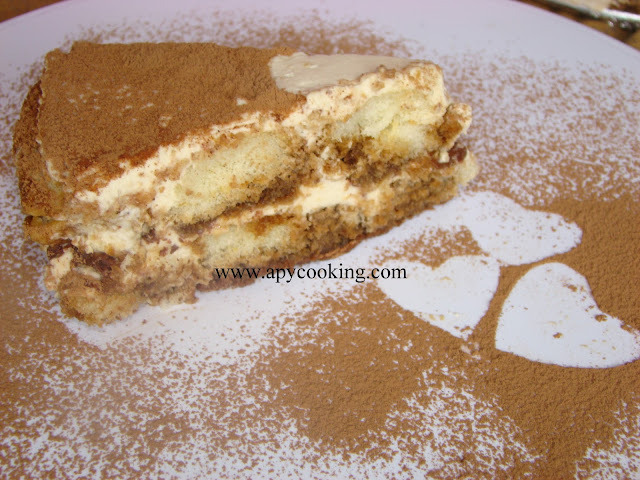 The Italian word Tiramisu literally means 'Pull me up' and you do want to do exactly that when you see one. I did not use raw eggs because I wanted to sleep without salmonella nightmares, specially since my son would be happily eating the Tiramisu. I cannot call this an eggless Tiramisu, since the lady fingers I used did contain eggs. 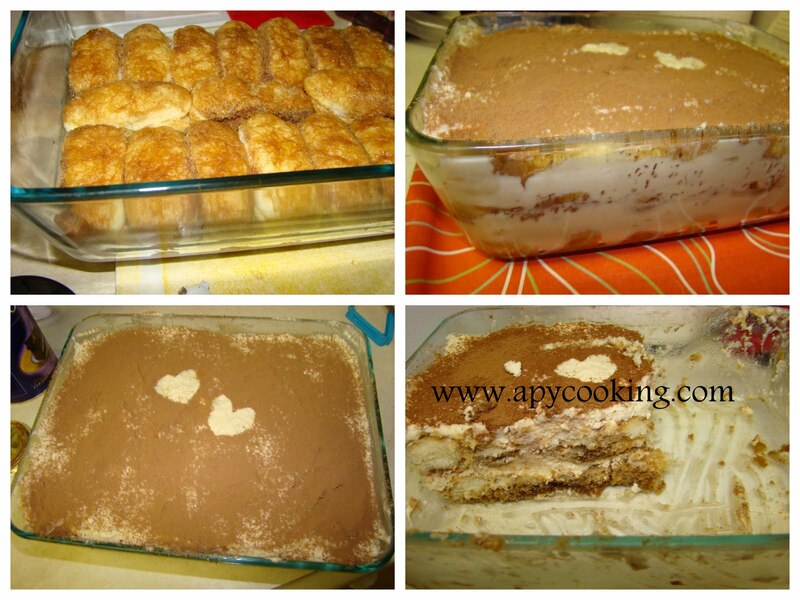 If ladyfingers are not available, you can use a sponge cake. [Lady fingers, not to be confused with okra, are sponge cakes shaped like a finger]. 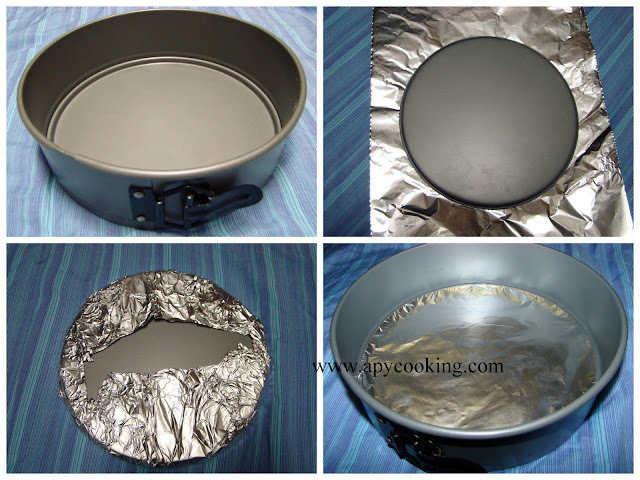 If you are using a springform pan, line the base with foil. [Since this is a no-bake cake, you can use any container and scoop out the tiramisu if you wish]. [See update]. 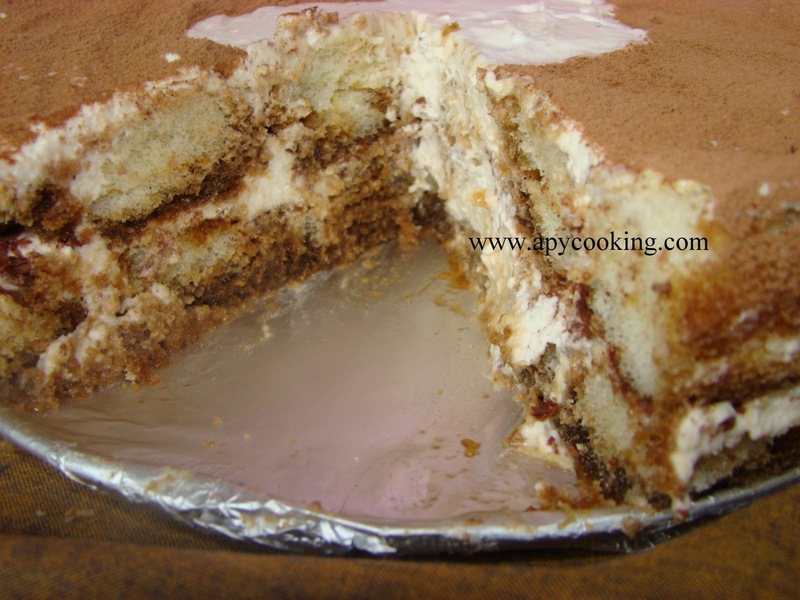 If you wish to border the cake with ladyfingers, check the original recipe. [Make sure you have extra ladyfingers]. Prepare the espresso syrup by combining all the ingredients mentioned under it. Prepare the filling. 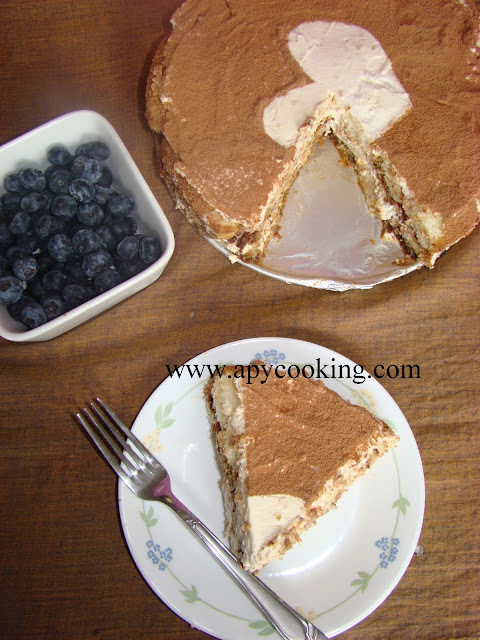 For this, with an electric mixer, beat heavy/whipping cream for a few minutes till soft peaks form. In a separate large bowl take the mascarpone and mix well with vanilla, sugar and 2 tbsp of espresso syrup. 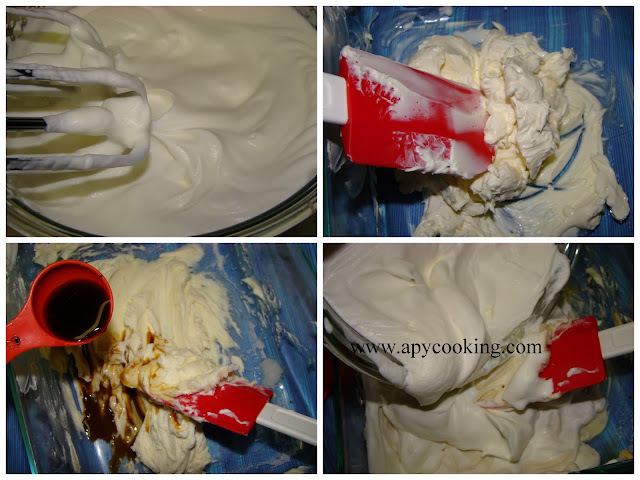 Fold the whipped cream into the mascarpone mixture and mix. Dip either sides of the ladyfingers in the expresso syrup, very lightly for just a second [otherwise the lady fingers will be a soggy mess, I learnt it the hard way as you can see in the picture]. Place in the pan so that they fill the entire base, cutting them into shorter length if needed. 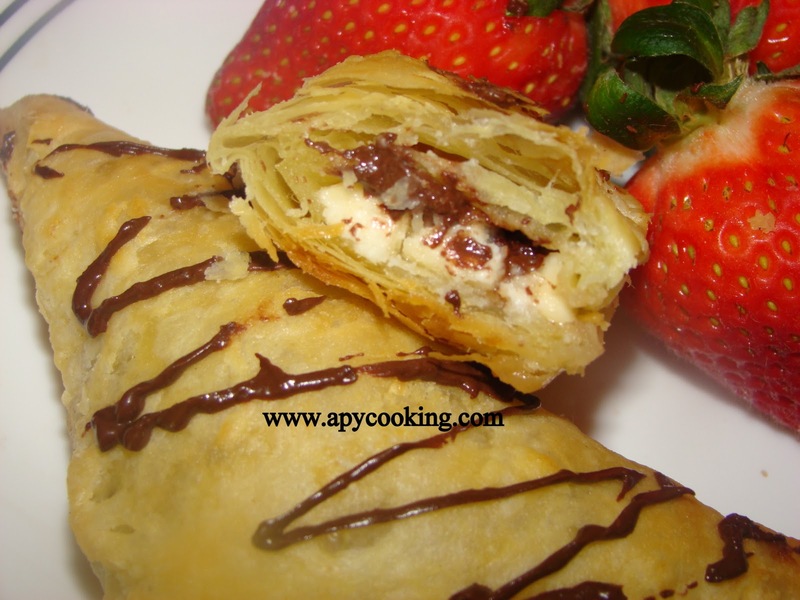 Layer with half of the mascarpone filling. Sprinkle grated chocolate. 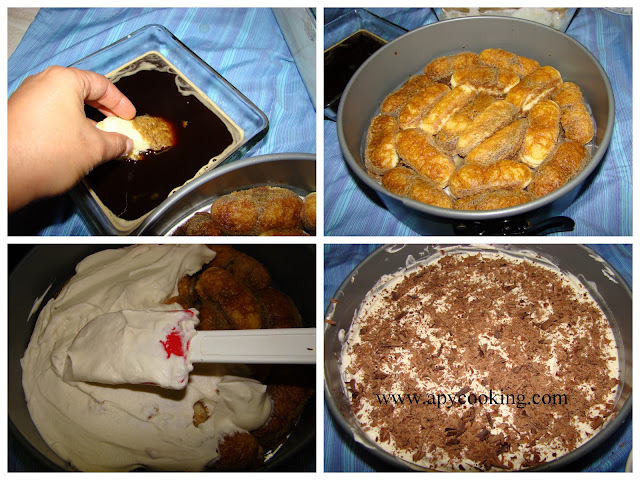 Make another layer of ladyfingers and the rest of the filling. Cover with a plastic wrap and refrigerate for atleast 4 hours [or overnight]. ...making some pretty design if you wish. 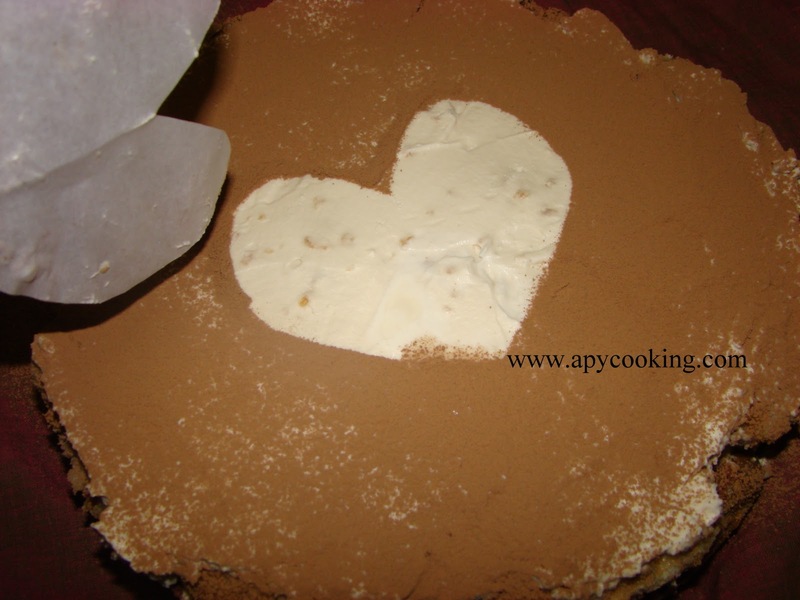 Just cut out a shape on a parchment paper and place it on the cake before dusting. Remove the paper and voila! This is a virtual piece for all my dear readers and blogger friends. Thanks for your support! I made tiramisu in a large glass dish and it was much faster since I did not have to worry abt foiling the pan. I just soaked the ladyfingers and placed them in the glass dish and went about with the layering. I then scooped out the yummilicious pieces and served them. Just make sure you have an extra supply of ladyfingers if you are using a really large glass dish, so that you don't run out of them. A generous swirl of date and tamarind chutney on my chaat, and I'm a happy camper. This sweet-tangy and slightly spicy chutney lends a great flavour and I cannot imagine chaat minus this. The measures are approximate. Jaggery usually comes in blocks and it's a pain to try and fit it into a tablespoon, so just eyeball it. 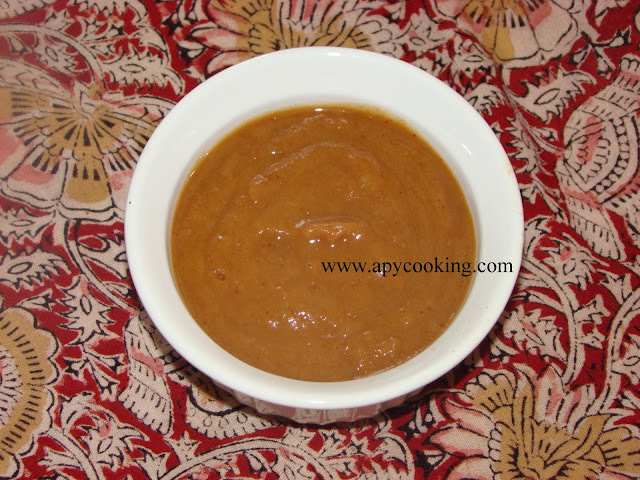 I used a large piece of tamarind, again approximately 2 tbsp, but you can increase or decrease it depending on how tangy you like the chutney. Bring about 1 1/2 cups of water to boil. Add dates, jaggery and tamarind. Boil for 10 to15 minutes, stirring a few times in between. Add chilli powder, cumin powder and salt. Allow to cool. Blend [You can add some water when blending if you want a runny chutney. I added about 1/2 cup water]. Strain if required. Relish with samosas or pakodas, in combination with Mint Chutney. During my last India trip, I met Aparna of 'My Diverse Kitchen'. We had lunch together and chatted about our common interest - food. 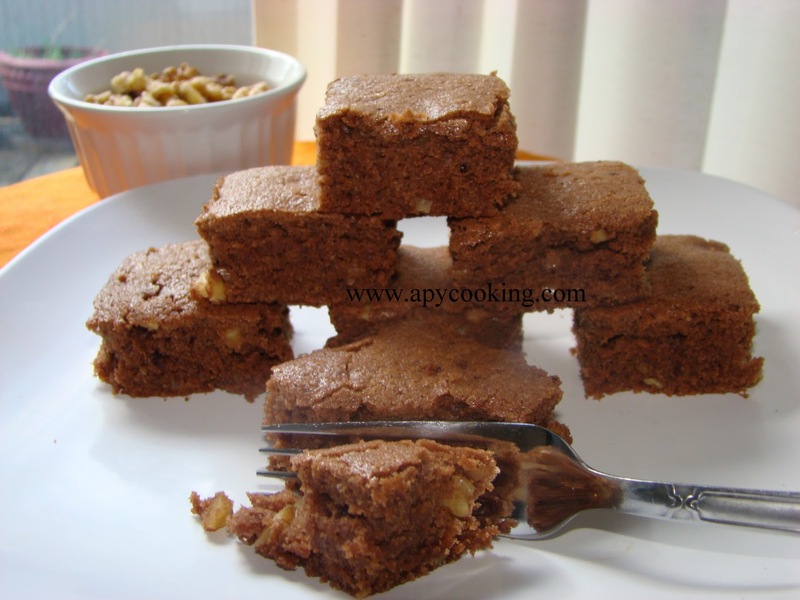 Aparna brought with her some chocolate walnut brownies for my family which all of us enjoyed. I got the recipe from her and tried my hand at these brownies. 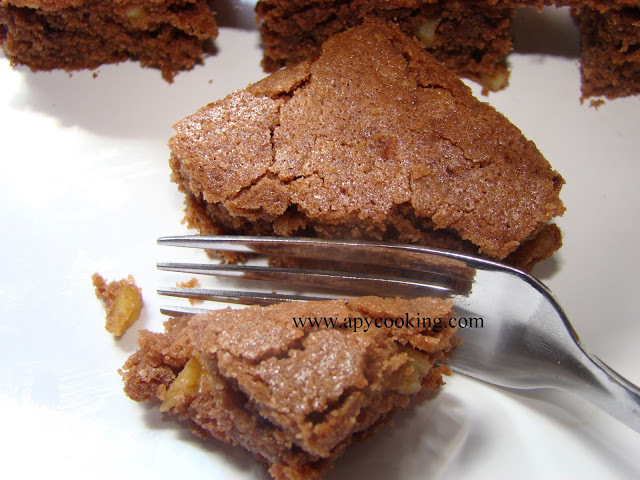 As Aparna mentions in her blog, the brownies have a slightly cake-ish texture. I made some minor changes - I had run out of baking powder so haven't added any. I also added some salt since I used unsalted butter. I used half white sugar and half light brown sugar (next time I will probably opt for 3/4th cup white sugar and 1/4th cup brown sugar, since I found the brownies a tad less sweet). For the original recipe, go here. Melt butter (completely) in the microwave. 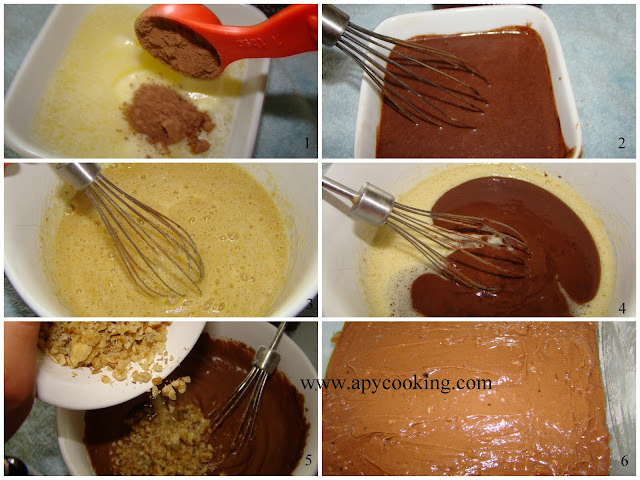 Add cocoa powder, mix with a fork or whisk and microwave for a few seconds to form a smooth paste. Cool. 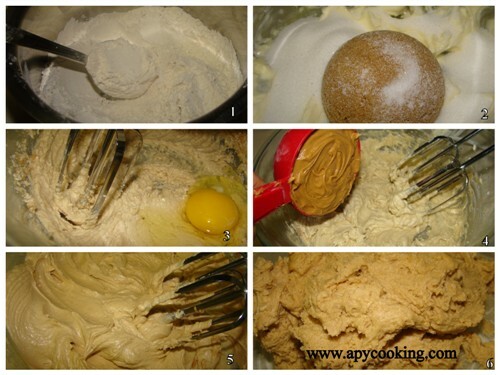 In a large bowl mix sugar and eggs thoroughly with a wooden spoon or a whisk. Add the butter-cocoa paste and mix well. Add flour, salt, vanilla and mix further. Pour in the chopped walnuts and mix well. Pour into a greased or lined 8" square pan (I used a rectangular pan of similar proportions). Bake for 25 to 30 minutes till brownies are done. Allow to cool. Cut into squares. Enjoy hot with a dollop of vanilla ice cream and chocolate sauce if you please! Sending these to Divya's Brownie event.